December 2018-March 2019 "South Watt", 22x15" watercolor, 2nd Plave at Art Extravaganza at Laguna Town Fall March 23, 2019. Judge: Telagio Baptista. I will donate 1/2 of proceeds to Christ's Hope International, Caring for AIDS Affected Children in Africa. 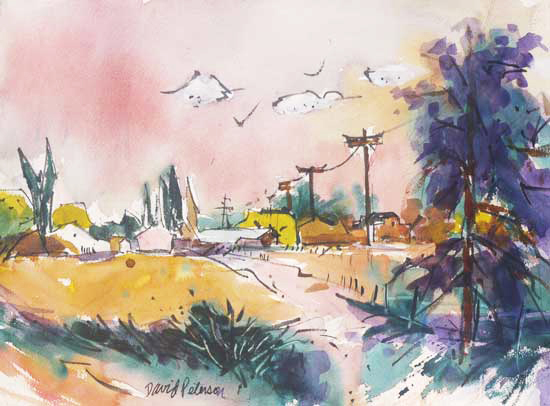 "Boeger Winery, by the Left-Hand", 22x15" watercolor, entered to the 7th Annual Open Show at the Elk Grove Fine Arts Center. :( Not accepted! 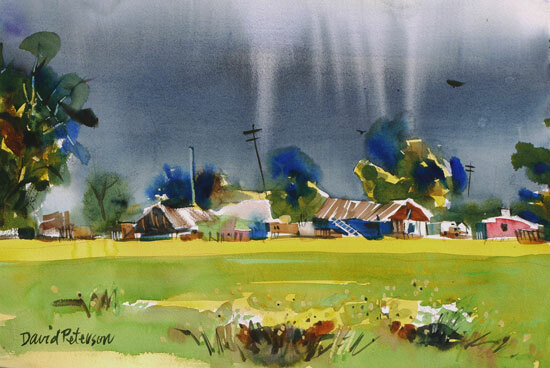 But you can see it in the WASH Members Show April 2-20, 2019 at Sacramento Fine Arts Center. 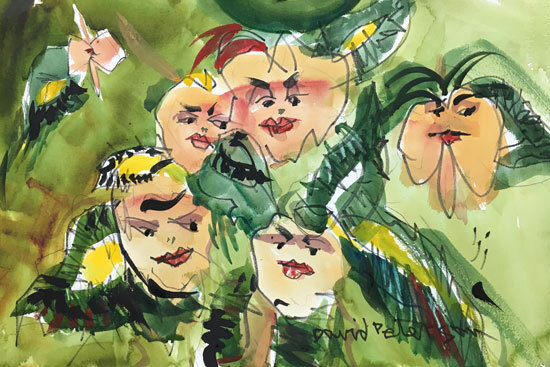 "Begonia Sisters", 22x15" watercolor. Join me at the Reception for "Bizzare and Surreal" Wednesday, Jan 30, 5:30-7:30 at Rancho Cordova City Hall, 2729 Prospect Park Drive, Rancho Cordova, CA 95670. The exhibit runs into April. 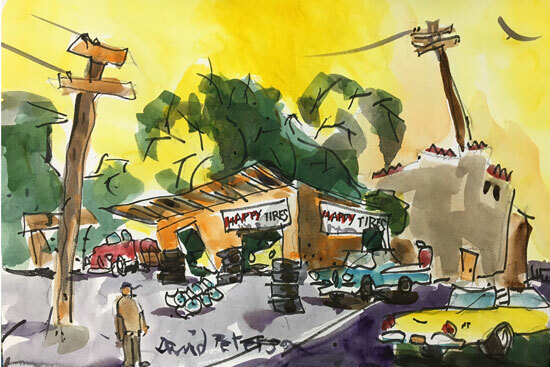 "Happy Tires", 22x15" watercolor, by the left hand. Happy Tires is a real place, I dunno how happy it is there . . . #3305. This painting has been accepted Magnum Opus 30, Sacramento Fine Arts Center's Annual International Open Show, February 19-March 17, 2019. 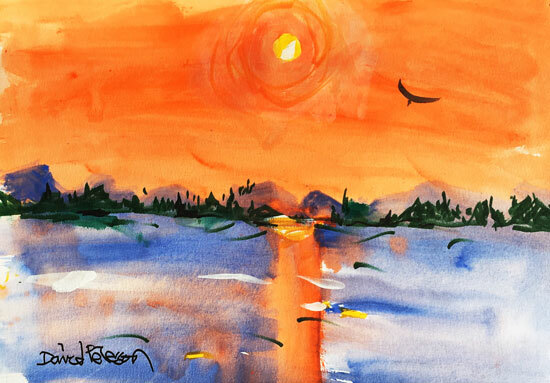 "Tahoe Sunrise, by the left Hand". 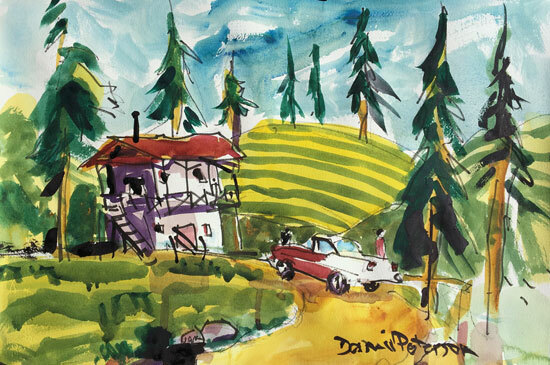 22x15 watercolor was dontaed to Ars Grata Artis, an art drawing at Sacramento Fine Arts Center. Congrts to the new owners! 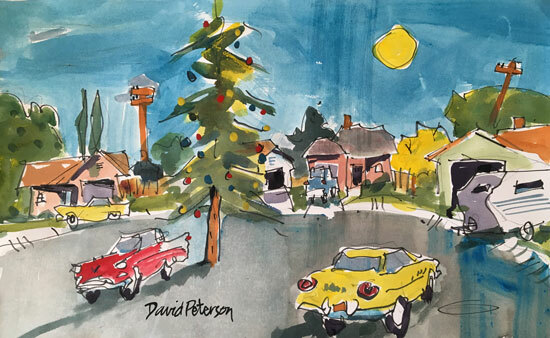 "Christmas Tree Court", #3227, 22x15" watercolor, one in a series. A California Christmas. Now showing at Rancho Cordova City Hall through the end of 2018.